Callington is 15 miles from Plymouth on the A388. 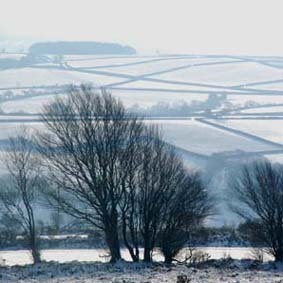 It is also on the A390, 8 miles east of Liskeard and 8 miles west of Tavistock. The A30 and A38 trunk roads are close by. We have limited parking but there are some on-street spaces around Lower House and some single yellow lines allowing you to park overnight from 6.00pm to 9.00am. There is also a pay and display car park two minutes walk away, where it is possible to park all day for a modest sum and for free overnight and for most of the weekend. There is also a free car park under ten minutes walk away. Try planning your route with Google Maps or the AA Route planner. We can collect you from Liskeard Station (8 miles away from us). Trains run from London Paddington about once an hour. For Liskeard make sure your train is going further west to Penzance, Liskeard is the first stop after Plymouth. If you are coming in on Sunday afternoon try and choose the train that arrives at Liskeard at around 5pm to coordinate with other people on the course. Airports in the South West include Newquay (42 miles away), Exeter (45 miles away) and Bristol (94 miles away). There are rail connections to Liskeard. There are buses about once an hour from Plymouth to Callington. Callington bus station is a 2min walk away from us.